The girl [daughter] of a house [family] in Niekawa village of Chichibu district of Bushō once entered [another family] as a bride, but [she] separated from the alliance [divorced] and returned to her actual [original] house [birth family and stayed; and when regarding the girl [which many people had talked about] [some people] had reputed that as there was [she had] no hole even though she had gone as a bride she could not remain, an imprudent [foolish, rash] young party of the village, four or five people [men], talked together [conferred], and [speculating] whether there is or is not a hole [decided] to try and see [for themselves], and when one night, taking [enticing] the girl out, not letting her say one way or the other, the four or five people [men] went to the extent of ravaging [her] turn by turn, the girl's parents sent a complaint to Ōmiya distsrict. Bushū (武州) was otherwise known as Musashi province (武蔵国 Musashi no kuni). The village and district entities in this story are now part of Saitama prefecture. Niekawa village (贄川村) merged with another village as Shirakawa village in 1889, Shirakawa and another village merged as Arakawa village in 1943, and Arakawa village, another village, a town, and Chichibu city were merged into larger Chichibu city, in Saitama prefecture, in 2005. The Ōmiya district (大宮区 Ōmiya-ku) was one of many administrative regions established in 1872. Later a city, Ōmiya is now part of Saitama city in Saitama prefecture. 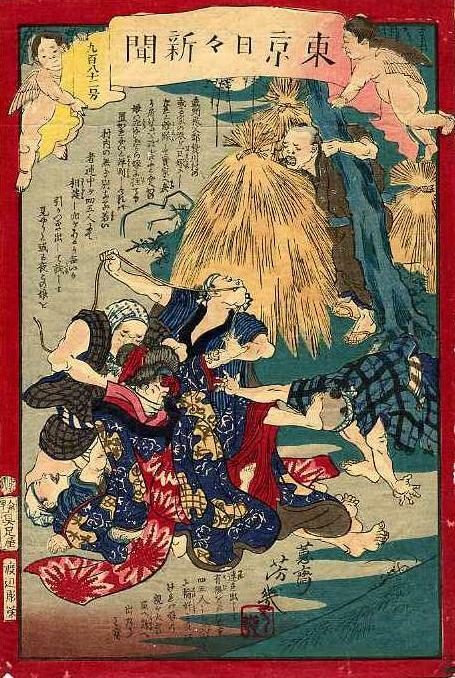 For more about the 1872 administrative system and Ōmiya, see the commentary to TNS-923 Benzo kills rival. not letting her say one way or the other reflects 有無 (うむ) を云ハせず (umu wo yuhasezu > umu o yuwasezu). The Sino-Chinese compound "umu" (有無) is used with various negative forms of "yuu" or "iu" (言う、云う) when describing (1) preemptive action, taken without warning, before someone can say anything, forcibly, or (2) something too compelling or persuasive for words. "Umu" literally means "exists" (有 u, aru) or "does not exist" (無 mu, nai) -- hence "to be or not to be" -- or "yes" or "no" -- with regard to the "existence" or "presence" of a given condition. "Umu o yuwasezu" thus appears to echo the speculation as to whether "there is or is not" (あるか無いか aru ka nai ka) a hole (穴 ana), and implies that the men didn't bother to ask the woman, or heed the protests she most likely made.